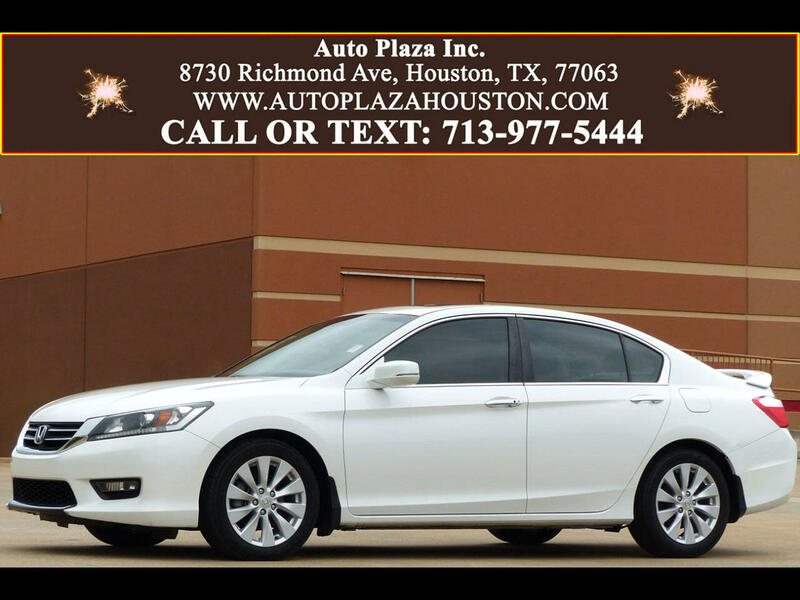 Used 2014 Honda Accord EX-L for Sale in HOUSTON TX 77063 Auto Plaza, Inc.
Auto Plaza Inc Proudly Presents this Low Mileage 2014 Honda Accord EX-L Sedan with a Smooth Automatic Transmission. This Car has Earned itself a place in the Hearts of People Everywhere since it was first introduced to the Market. Options Include, Power Sunroof, Lane Departure Warning, Forward Collision Warning, Rear Spoiler, Push Button Start, Power Heated Leather Seating, 17' Alloy Wheels, ECON Button, Rearview Camera with Guidelines, Blind Spot Camera, SMS Text Message Function, Bluetooth HandsFree Link and Streaming Audio, Pandora Compatibility, XM Radio, CD/ Mp3 Player, AUX Jack/ USB PORT, Illuminated Steering Wheel-Mounted Controls For Cruise / Audio / Phone, Dual Zone Climate Control, Traction Control, Anti-Lock Braking System, Tire Pressure Monitoring System, Daytime Running Lights, Chrome Exhaust Finish, Automatic Lights, Daytime Running Lights, Power Windows, Power Mirrors, 12-Volt Power Outlet, Tachometer, and Much More! Whether you are a BUSINESS person wanting your vehicle to reflect your Professionalism, or a FAMILY person concerned with adequate space and comfort for the children, this car is Evidently Perfect for YOU. This Accord has a Theft Recon Title So, CALL TODAY to Schedule a TEST DRIVE!! !